The previous header photo was of the New Zealand classic M Class, a restricted lapstrake design originally by Arch Logan from the 1920's. Below is another M going upwind. I culled these beautiful photos from Facebook so I'm not sure who the photographer is. Neil Kennedy, New Zealand trade consultant, and sailing historian on the side, sent along several emails detailing the history of the M Class. A tip-of-the-hat to Neil from Earwigoagin for filling us in on these classics. "Now to try and give you a hopefully " brief " understanding of the two photos and the origins of the class. 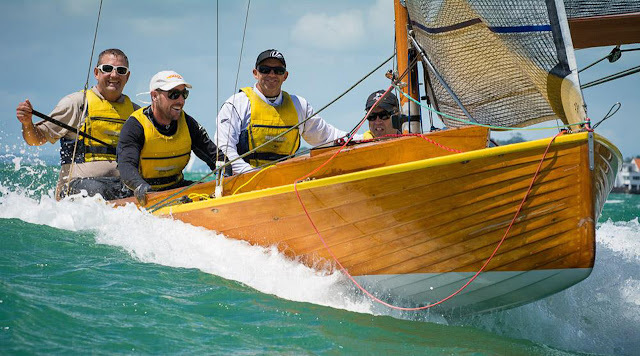 The yachts concerned are M class which is a restricted center board class that sprang from a design by Arch Logan in 1922 for a prominent Auckland family for their two sons. The first named "Mawhiti" and the second "Manene" were launched in 1922 and made an immediate impression. They evolved into a class which attracted the interest of the Royal New Zealand Yacht Squadron ( the leading yacht club based in Auckland) . 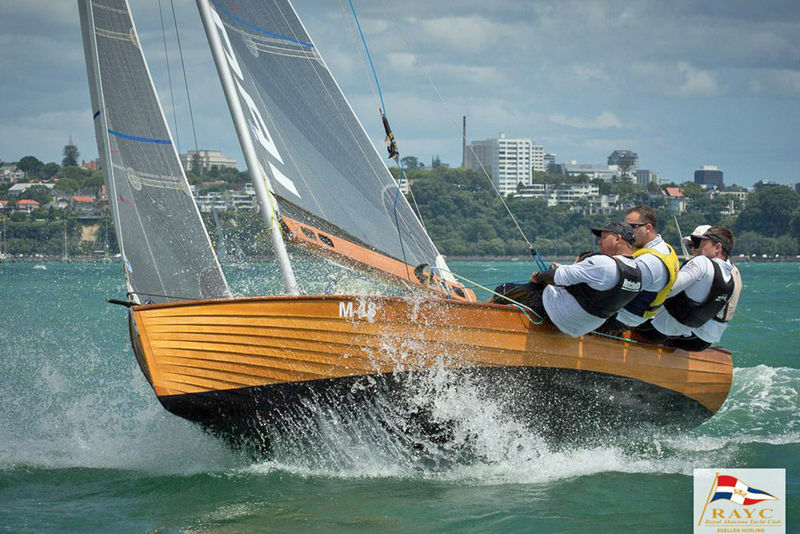 The "M" designation came from a decision by the Auckland Provincial Yachting Assoc to classify the various and rapidly growing yachting fleet in Auckland by designating the various types of keel boats and center boarders with a letter and a number. "As with all great ideas it worked until vested interests bent the rules. In the case of "Mawhiti" and her sister ships it was assumed that they would be classed with the other 18ft center boarders as a V class, but the RNZYS decided that their new restricted centerboard class was too valuable to be lumped in with the "working man's" V class 18 footers, and "persuaded" the APYA to allocate the letter M to their new fledgling class, probably based on the fact that the first two had names starting with M.
"The authority on the M class or "Emmy" as it was colloquially known is Robin Elliot whose book Emmy is a fascinating study of the class. Robin and I go back to the 60's when I was a junior customs clerk in the Customs department in Auckland and Robin was a customs agent clerk. We had a mutual interest in yachting and history which has remained until today. "Now back to the M Class photo's. The Header page is "Mach One", M46, which was the first of five boats built by Owen Reid to his own modification of the Laurie Davidson designs which had dominated the class from the 1960's onwards. 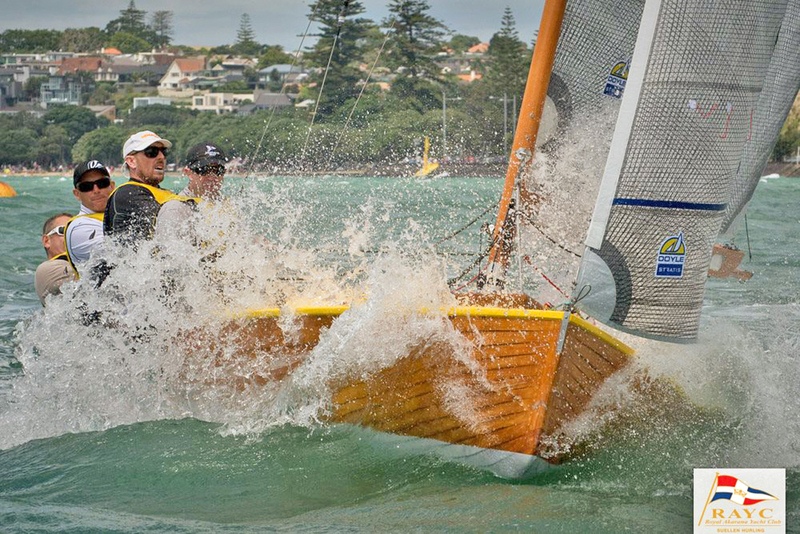 The Reid boats are very fast down wind and are unique in that the plank lands are glued despite being made of solid Kauri in normal clinker fashion. All the planks were saturated with Everdure to stabilise them. "Mach One" weighed 421kg when launched when the average was closer to 500 kgs so a minimum weight limit of 450kg hull and center board is now in place. The second photo, "Menace" is M48 and the last of the Reid boats to be launched, she is one of the best now and fitted out just like a normal top line racing yacht. As you can see they have a four person crew; yes, there are a few girls crewing but they are powerful boats needing a bit of muscle in windy conditions. They have been based for years at the Royal Akarana YC in Okahu Bay in the inner east of Auckland's Waitemata Harbour and currently have about 8 to 10 active boats. "The Mullet Boats are not connected in any way with the M's . Their origins are from the fishing smacks that fished in the shallow bays and estuary's of the Waitemata harbour, an inner Hauraki gulf where mullet abounded. They were identified by length of hull ( but not overall as they carried bowsprits and overhanging booms) in 20, 22, 24, 26 and 28 footers. They were sailed by a crew of two and were fast and weatherly half decked boats, that once they had caught their quota (around a ton or 40 dozen fish) they headed back to the Auckland wharfs to sell their catch (no refrigeration) in the best possible condition. They were a straight stemmed shallow draft craft with a broad vertical tuck, barn door rudder with a large rig two headsails set off a long bowsprit and a larger gaff mainsail. Built single skinned carvel with steamed frames from the 1890's with half decks and a small cuddy aft of the mast. Powerful boats that could, in suitable conditions, out sail many longer keelboats of the day. "In the 1900's as fishing stocks declined they became popular as racing craft for the working class based around the inner western Ponsonby Cruising Club which still sponsors them today. They were known by their letter designation "H", 26ft's only a couple are around today, "I", 24ft's which were never that popular. "L" 22ft's the most famous of them which still race with modern rigs, and "N" 20ft which were only a few and you can see one on the Waitemata Woodies website. Another article on the web about the NZ M Class from sailworld.com/NZ. A beautiful vintage hand-colored postcard picked up from the Web. One of my favorite Dylan tunes. Nonsensical lyrics but great country swagger. Done originally by The Byrds but this video features this toe-tapping version by the Nitty Gritty Dirt Band and friends. In a kind of reverse-think way, I like to play this song to mark the onset of true, warm, spring weather. The previous header photo was of two El Toro dinghies racing. The El Toro is a 8' (2.438 meter) V-shaped, single chine, transom bowed dink, one of the many variations of the 1939 MacGregor Sabot design. Here is the entry for the El Toro in the annual class review issue of One-Design and Offshore Yachtsman magazine, circa mid 1960's. I learned to sail in an El Toro. My family moved to Maryland in the early 1960's and we bought a house in a community with a beach and small boat launching. 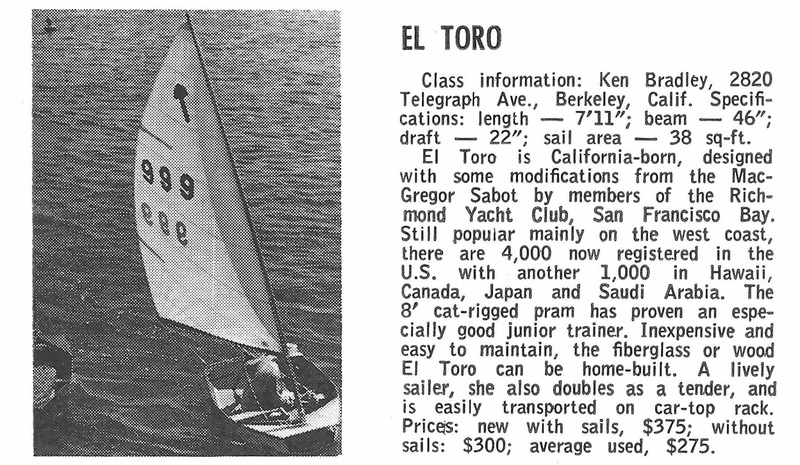 My Dad decided we should learn to sail and for some reason he decided our first boat was going to be the diminuative El Toro, a glass version built in California and sold by a local sailboat dealer. Initially it was my Dad, my brother and I taking it out on Sappington's Creek; learning by doing. My Dad eventually decided the El Toro was too small and bought a 16 foot Rebel sailboat for family sailing. My brother just wasn't into sailing as I was. Through attrition, the El Toro became my personal watercraft, the gateway to endless summer adventures on the Severn River. I have written about some of my experiences in my El Toro dink in this previous post and also this post. One of my most vivid memories was the first time I capsized the El Toro. As we were learning to sail the El Toro out of Severndale Beach, many times we were also accompanied by two other small wooden sailboats sporting novice sailors; a Wee-Sort 11 footer with jib and an even smaller 6 foot dinghy sailed by a friend who was the same age as me. 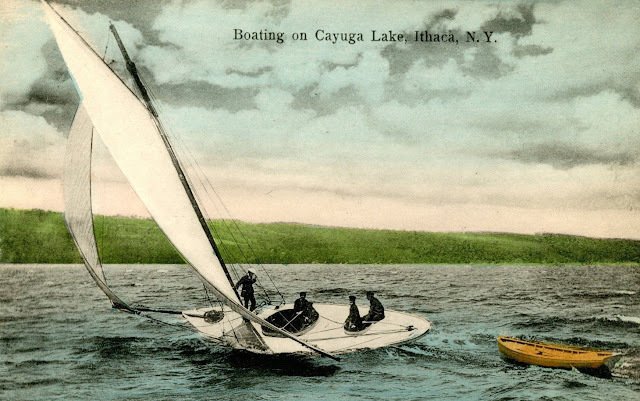 The 6 foot sailboat was built by the father who also ingeniously made a small trailer for the boat that could be towed behind a bicycle (our community beach was about 1/2 mile and across a busy road from the community). The day I capsized, both the 6 footer and I, in my El Toro, were sailing just off the community beach. The wind was swirly and gusty and I was dumping the main and rather fearfully watching the gunwhale ship water. Suddenly the 6 footer capsized and there was much shouted instructions from the adults on the dock. Eventually a rowboat was commandeered to traverse the 30 yards to help my friend. I, my ego near bursting, was congratulating myself on handling conditions my friend obviously found too overwhelming, when, wham!, over I went as well. I remember the initial shock and surprise to find myself swimming alongside the sail but then my book-learning kicked in. Per my readings, I had to get on the daggerboard and lever the sailboat back upright. That I did, after some time since I was a scrawny kid, and the El Toro came up, mostly filled with water (this El Toro just had a small bow tank and a small stern tank for flotation). I slithered into the water-logged cockpit, was able to bail some water out and then creep toward shore. I can't remember if I took the mainsail down and paddled in or if I was able to sail in. Either way, I was back on the shore and the adults didn't have to come out to get me. That was the green light. That capsize and successful self-rescue replaced fear with self-confidence. I was now set to go beyond the creek and to places far into the river. Every so often I sit down and sketch up a design I think would be cool to build. I posted this previously with a rough idea I had if you redesigned an Australian Six Footer and made it into a very tiny singlehander. Below is a sketch of a very simple junior boat based on a punt/barge type, the bottom being essentially three flats. You could build it out of 6mm plywood with some stringers, or some rough lumber, cross planked, as they did in days of olde. You could put all your framing/cleats on the outside of the side panels as Bolger did on some of his QD (quick and dirty) boats - or not. I call this design "Kid Simple". I originally designed it to be a good rowing boat (there is supposed to be a thwart just aft of the daggerboard case to sit on for rowing) and then added a sailing rig based on the sprit rig of the Optimist. I started off large and then made it smaller (the original length being 10 1/2 feet and then shortened it to 9.9 feet length, by shortening the bow flat - I'll let the reader do the metric conversions). It has a healthy skeg to help in tracking when rowing and I would envision a large rudder close to the Opti in size. Here are two JPEG's. Dimensions in feet, tenths of feet, or sometimes inches. Again you can use the pop-out icon in the top right of the drawings to open in an another tab to print. The first sheet has the original idea with modifications noted. The second sheet has a modified sheer and length and includes the rig. Since there has been some international interest in building Classic Moths, I offer up the U.S Classic Moth sail measurement. Our Classic Moth sail is a traditional pin-headed sail (similar to the Finn Dinghy in planform). The Europe Dinghy class has taken the basic Classic Moth planform and added more roach to the top batten. The sail areas between the Classic Moth and Europe Dinghy are similar since the Classic Moths allow more roach in the middle of the sail. In practice we don't notice any difference when someone shows up to race with the Classic Moths using a Europe Dinghy sail (technically illegal but we have allowed them to race from time to time). Many of the Classic Moth sailors who sail the Europe Dinghy have found a Classic Moth sail on the Europe Dinghy to be a faster combination than a cut-down Europe Dinghy sail (not sure why this is the case - chalk it up to another hard to explain mystery). In our girth measurements we have recently converted over to the ISAF method of throwing an arc from a fixed point (1/2 or 3/4 or 406 mm) on the leech. Again, with this image, use the pop-out icon (top-right) to get the image into another tab for printing.